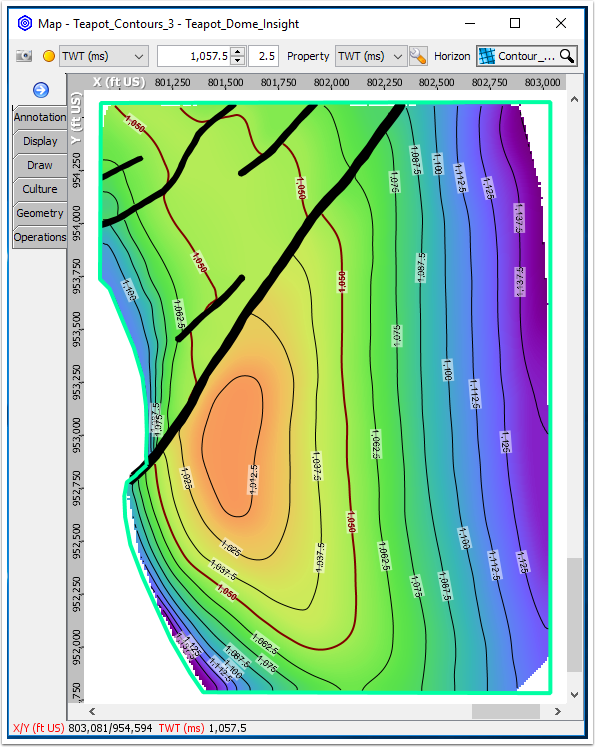 Integrating all available data is crucial for proper subsurface evaluation. 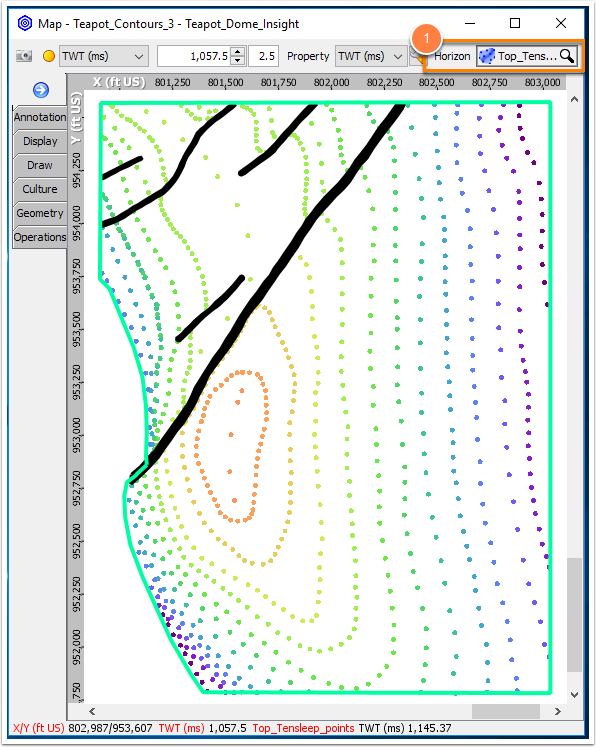 Sometimes available data may include structure contour maps taken from literature or other sources. 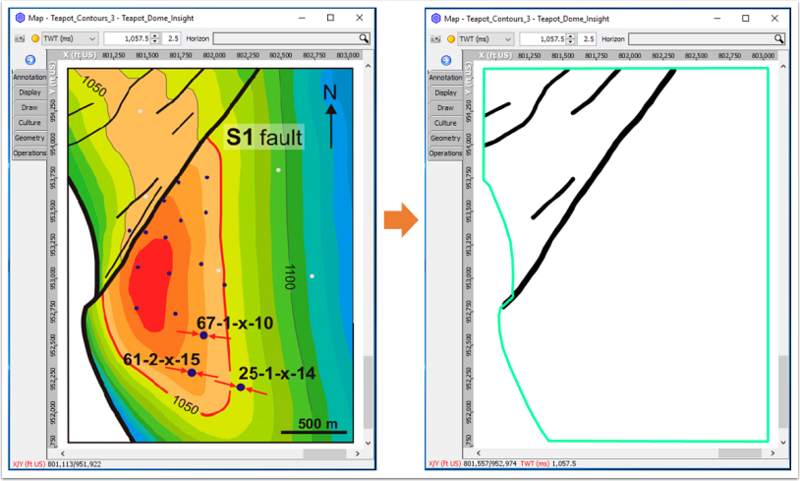 This workflow demonstrates how to trace contours using faults sticks to create a file of XYZ points that can be imported into Insight as a horizon. In this example, an image of Top Tensleep TWT structure from Chiaramonte et al. (2011) is transformed into a horizon in Insight. Import the image via Import > Culture (see Importing Culture Files). 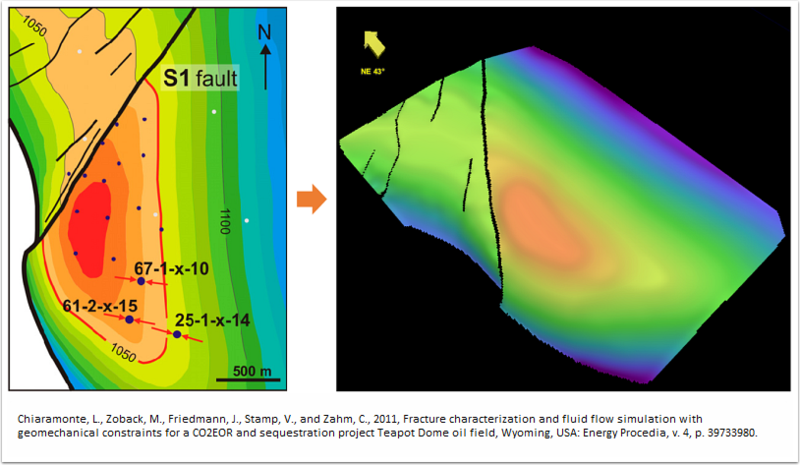 Create a new fault for each contour line (see Picking Faults). Important: Pick faults at a high resolution! The goal is to create a horizon based on an input file containing XYZ points. Each individual point will be used to create a horizon once the file is imported back into Insight as a horizon. In this example, a point is added about every 50 m along a contour line. Note: The flat appearing areas above contour 1010 and 1050 in the example likely have some curvature that is below the resolution of the contours. To make the horizon more geologically realistic, add a fault stick at the crest with a TWT value that is less than the contour value just below. This will add points higher in the structure so the horizon does not appear totally flat in these areas. 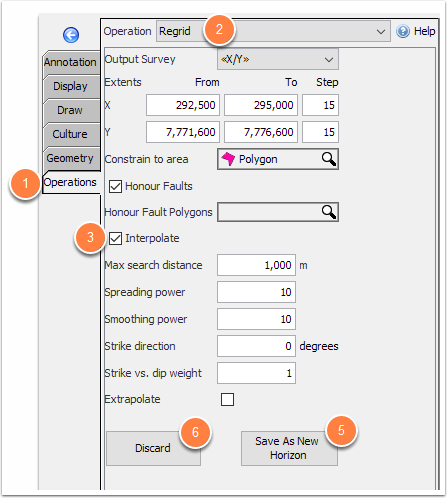 With the culture file displayed, add polygons around the horizon boundaries and faults. This will constrain the area that is interpolated when using the regrid operation after importing the file as a horizon. 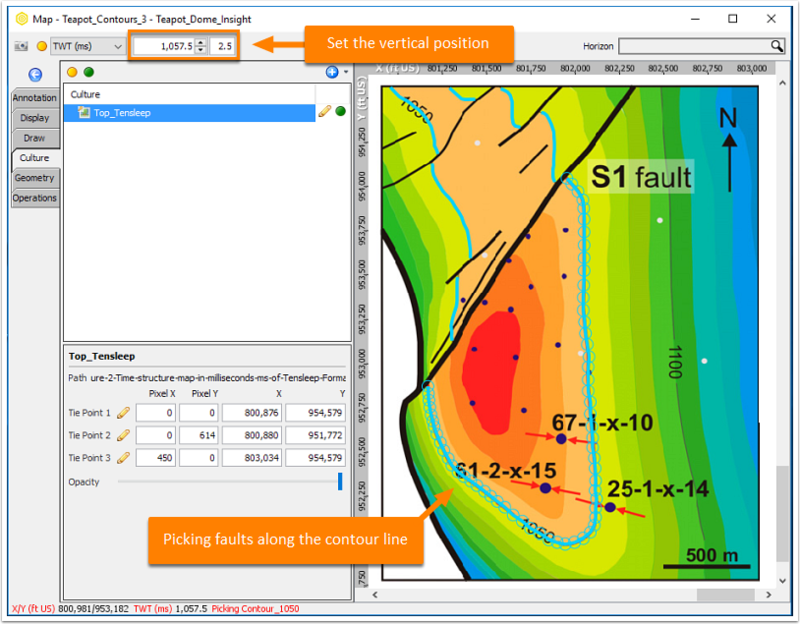 Highlight each fault sticks of the mapped contour in the Fault panel. Right-click > Export (see Exporting Faults). The exported file will contain information that isn’t needed when reimporting the file as a horizon. Once the headers are deleted, save the file. Import modified file as a horizon via Import > Horizons. (see Importing Horizons). 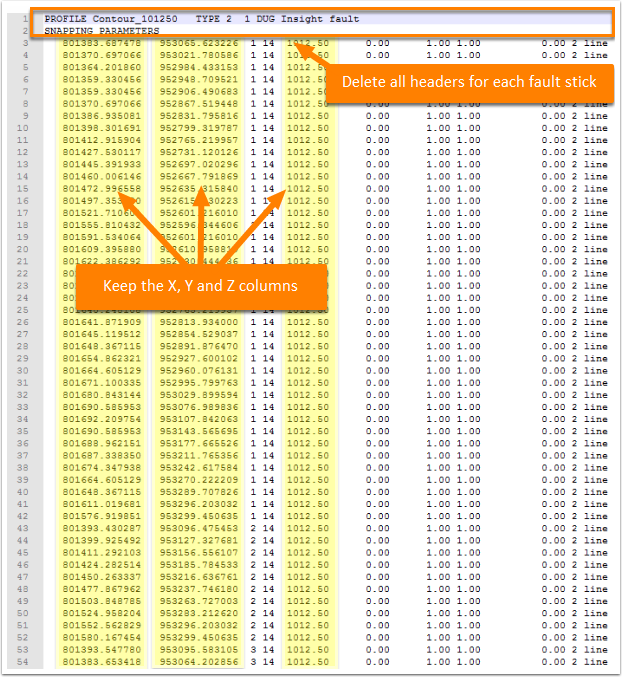 Assign the X, Y and Z values to the correct column. Go to Map View and select the horizon. The horizon will display as points on an irregular grid. To create an interpolated horizon, you’ll need to regrid the horizon and interpolate. In the Map View, click the Operations tab and select the Regrid operation to put horizon onto a regular grid. View the output and click Save As a New horizon to save the result. 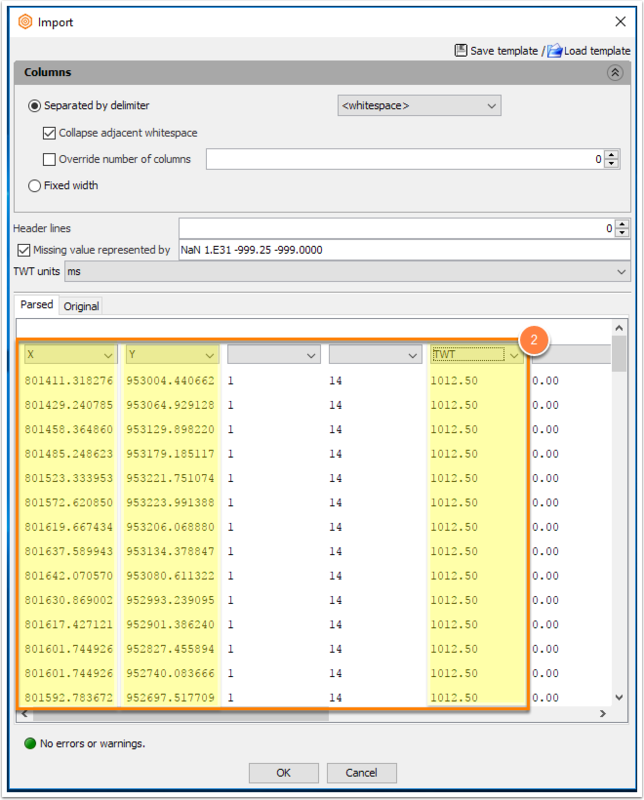 Click Discard if you would like to make adjustments to the regrid parameter. Once you have regridded and interpolated the horizon, QC the result in Map View. Turn on contours for easy comparison to the original contour map that the horizon is based on (see Contouring in Map View). Use Operations > Smooth as necessary to create a smoother image (see Horizon Smoothing). In areas that appear flat, may want to add control points slightly lower (if a trough) or higher (if a dome) so that horizon isn’t totally flat. This should make for a smoother, more realistic horizon and may help avoid odd contours lines. Add control points (using fault sticks) in areas with large gaps to avoid the gaps from appearing when interpolating. Use small tile size when smoothing, then smooth over multiple iterations. Prev: How can I update a horizon to tie markers at wells?